The purpose of this class is to familiarize students with the life history, behavior, and ecology of Pacific salmon and trout. The lectures provide detailed information on the marine distribution, homing migration, energetics, and spawning behavior of adult salmon, the ecological processes linked to their carcasses, the incubation and emergence of their offspring from gravel nests, the ecology of juveniles in streams and lakes, their seaward migration, and ecology at sea. This class is fast-paced and information rich, and it is expected that students are already familiar with fish biology and ecological principles, and have also had experience processing data and writing scientific papers. 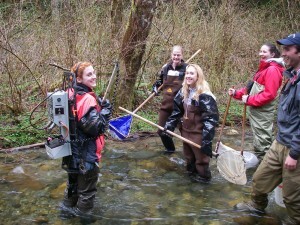 The field trips go to a stream to sample fishes and the available habitat to assess the extent to which salmonid species segregate from each other, and from older/younger members of their species. 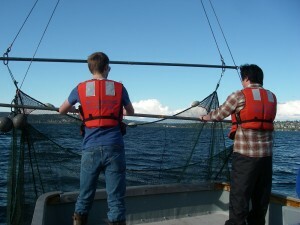 We then sample on Lake Washington to examine the diel vertical movements and feeding by juvenile sockeye salmon and inter-specific competitors (longfin smelt and three-spine stickleback). We also view reproductive behavior at the Weaver Creek Spawning Channel in southern British Columbia. The class is offered annually in Autumn quarter. There are 3-credit and 5-credit options offered. Both have the same lecture schedule and exams but the 5-credit options involves the three field trips, associated labs, and papers based on data collected on these trips. The 3-credit option is designed primarily for graduate students, and is open only to undergraduate students who have taken FISH 312 or by permission. The writing assignment is an original research proposal.